Introduction: Temperature-controlled vessel sealers generate strong vessel welds and maintain a high safety profile. Combining focused bipolar RF energy, tissue compression, and time these devices forge collagen welds in 7 mm vessels with a burst strength averaging 800 mmHg. A novel technology enables precise temperature control at a molecular level, thus preventing overheating, char, and local thermal spread. This study compares temperature-controlled and uncontrolled bipolar devices against high conductive, collagen rich (arterial) and low conductive, collagen poor (venous) systems, seeking to distinguish differences in heat characteristics, energy delivery, and seal consistency. 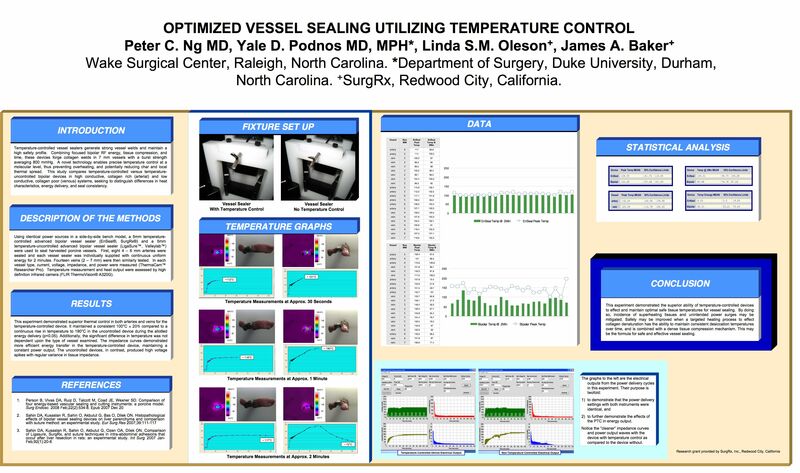 Methods: Using identical power sources in a side-by-side bench model, a 5mm temperature-controlled bipolar vessel sealer (EnSeal®, SurgRx®) and a 5mm temperature-uncontrolled bipolar vessel sealer (Ligasure™, Valleylab™) were used to seal harvested porcine vessels. First, ten 6 mm arteries were sealed and each vessel sealer was individually supplied with continuous uniform energy for 2 minutes. Ten veins (3-5 mm) were then similarly tested. In each vessel type, current, voltage, impedance, and power were measured (ThermaCam™ Researcher Pro). Temperature measurement and heat output were assessed by high definition infrared camera (FLIR ThermoVision® A320G).